FINAL DECISION: These characters end up being just so nice and I liked them tremendously. The contrast being their so good character and how they meet gives what might otherwise be a too nice story some dash. THE STORY: Matthew Cornwallis, Duke of Tyndale, is urged by his friends to put aside his grief at the death of his fiancee three years ago and attend the Donville Masquerade, a sinful gathering where masked guests meet for sexual encounters. There Tyndale meets a masked stranger who he ends up spending the night with. Isabel Hayes is a widow whose elderly husband was chosen by her parents in an arranged marriage. Curious about what she missed in her marriage, Isabel comes to the Donville Masquerade to watch. But then she meets a masked stranger who tempts her to find the passion she missed. Eventually, however, Isabel realizes that her lover was the man engaged to her cousin and who her uncle blames for her death. OPINION: I really, really liked the characters in this book. Both Matthew and Isabel are good and even gentle characters who find one another despite pasts which make them wary because the guards and shields are let down when they meet in a sinful and wicked way. This book is hot and it manages to do that with very likable and nice characters. Although both have some pain in their lives, their inherent positivism contrasts with some of the other characters in the book who dwell in their unhappiness. I really liked that about these characters. The willingness to make the best of things, to look forward, to try and be happy. Most of the conflict here ends up being external because these two hit it off almost from the start. In fact, they seemed so perfect for one another that I wondered how the dramatic tension in the story could be maintained — and yet it was. All of the parts work here. WORTH MENTIONING: I especially loved that we get to see so many of the members of the 1797 Club and their wives. 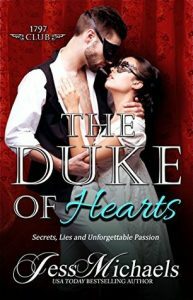 CONNECTED BOOKS: THE DUKE OF HEARTS is the seventh book in the 1797 Club series. The series tells the stories of a group of men destined to become dukes. Each book tells the story of one couple but the characters appear throughout the series. This book can be read as a standalone.